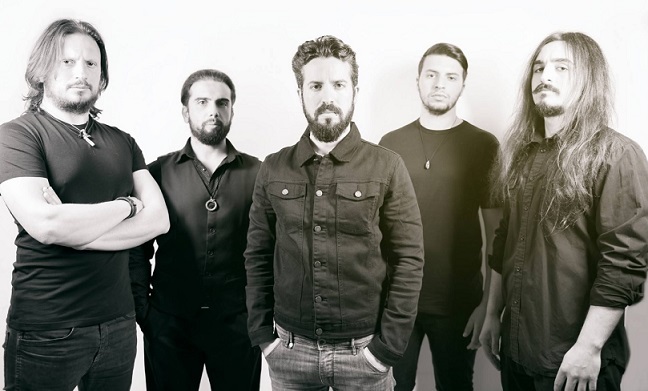 The band started three years ago when Giovanni Costabile (keyboards), Gianpiero Sica (bass) and Daniele Ippolito (drums), who had already played together in another band, followed Giovanni's idea to write new material that could express our musical interests. Soon after Francesco Del Vecchio (guitars) joined the band and became an integral part of our soundwriting process. When Marco Alfieri (vocals) who was a long time friend of ours joined the band, the line up was complete and we started writing our debut album "Catharsis". Last year in July we recorded a three-song live session cd at Sonic Temple Studio in Salerno (Italy) that served as a forerunner of our upcoming album. A few months before entering the studio Daniele was forced to leave the band, due to personal problems. So we entered the studio with session drummer Alfonso Mocerino who did a great job recording drum tracks. The whole album was recorded, mixed and mastered by Marco Mastrobuono at Kick Recording studio in Rome between December 2016 and February 2017. Then Alessandro Martellone joined the family and became our new drummer. Well, it's always difficult for an artist or a band to describe its own music. We generally use definitions such as Avantgard-progressive black metal in order to give the listener some suggestions about our music, but there's much more. We are not the black metal band a typical fan would expect. Our music is not just about fast guitar riffs, blast-beat and screaming vocals. There are some songs where these elements are present obviously, but "Catharsis" is a really complex work. Generally our songs are quiet long and a mixture of delicate atmospheres and harder parts are presented in a logical sequence in order to convey a large spectrum of human emotions: from angst, despair and bitterness, to hope and even some kind of resignation. The lyrical themes and the songs in general deal with the concept of rebirth. The album should be experienced as a process of purification, a journey which takes the listener through different aspects of human feelings. From the worst moments of life one should find the inner energy to overcome difficulties and let his soul fly free. To do this a person must transform himself and become someone else, not completely different from the past, but with a deeper level of self awareness. Moreover we have to say this album is dedicated to the memory of Luigi, a band's close friend and Giovanni's cousin who passed away two years ago and whose suffering and struggle to survive deeply moved us and influenced the whole concept of the album. 4.I know that the bands name comes from a term used in the theater of Ancient Greece, how does this name fit in with the musical style that you play? Ancient greek theater refers to Parodos as the first song sung by the chorus after its entrance from the side wings. It generally follows the prologue and precedes the dramatic representation that is about to take place on stage and serves as an introduction to the themes of the play. Likewise our music acts as an intoduction for the listener to the drama that life is, with all its implications and controversial aspects. Moreover we all live in Southern Italy, a place where Ancient Greeks settled their colonies 28 centuries ago. The roots of our culture lie in ancient greek art, architecture and philosophy and, in some ways, it still permeates our deep struciture as human beings. One of the best show we've had so far was the first we played in our hometown. Even if it was a small venue a lot of people came to see us. We really felt their warm support. It was important for us to test the audience reaction to our tunes played live. Inspired by the greek theater, the beginning of our shows has a sort of dramatic impact. We usually wear masks when we approach the stage just like the actors of the classical greek tragedy, which we take off right after the prologue ends and eventually our setlist begins. The day after "Catharsis" is released, we will play our relese party, when the record will be performed in its entirety. On the 4th of November we will perform at Cult Of Parthenope black metal fest in Naples at its second edition; then from the 10th to the 19th of November we will be on our first european tour supporting italian black metal act SCUORN, crossing Germany, Poland, Czech Republic, Austria and more. You can find all infos about the venues on our Facebook page. 7.The new album is coming out on 'Inverse Records', can you tell us how you got in contact with this label? In the most simple way. We sent our promo album to the label and they replied soon after. We found a very special person in Joni and everybody at Inverse Records who immediately let us know they truly appreciated our work and started promoting our album. 8.On a worldwide level how has the feedback been to your music fans of avant garde and black metal? Up to now, judging from the first international reviews, the feedback appears to be good. Of course, we expect some people may not like our music, especially because it does not follow the rules of traditional black metal. But we are confident that people can let the music reach their deepest emotions, regardless of genres and tags. It's quiet difficult to answer this question, especially at the point we are now. As a band we do not plan what kind of mood our next album will have. Soundwriting is a spontaneous flow that's really unpredictable. Among our main influences and source of inspiration there are Katatonia, Enslaved, Fen and the dreamy and ethereal sound of French bands such as Alcest and Les Discrets, just to name the most known ones. Every member of the band has different musical backgrounds but everyone tries to bring his own taste to our music so that it does not resemble anything in particular. We simply try to blend our influences in order to create something that would sound fresh and new in a certain way. Our singer Marco is also a professional photographer and he dedicates himself to his art with passion. We all share common interests in theater, mithology and litterature. Every aspect of our personal interests takes part in the creative process. No matter what form of expression is suitable to you as long as it keeps an open door to real feelings. First of all we would like to thank you for the opportunity to talk about us and our project. For those of who may be interested in our music, follow us on our social pages (Facebook, Twitter and Bandcamp). Again, thank you and join the Catharsis.